I left Seattle with heavy heart under cloudy skies on Friday April 29, starting the long and lonely drive of nearly 800 miles down to Loomis, CA, just northeast of Sacramento. My close friend Dave Pinegar had died on April 18 in a rappelling accident in Joshua Tree National Park (see the replies to Dave's first TR on TAY for more info). His family was hosting a celebration of his life, followed by dinner and an all-night barn party, on April 30 in his hometown of Loomis. With the forecast looking sunny and beautiful for the entire next week in California, I knew that I should ski a lot while down there, for Dave and for myself. 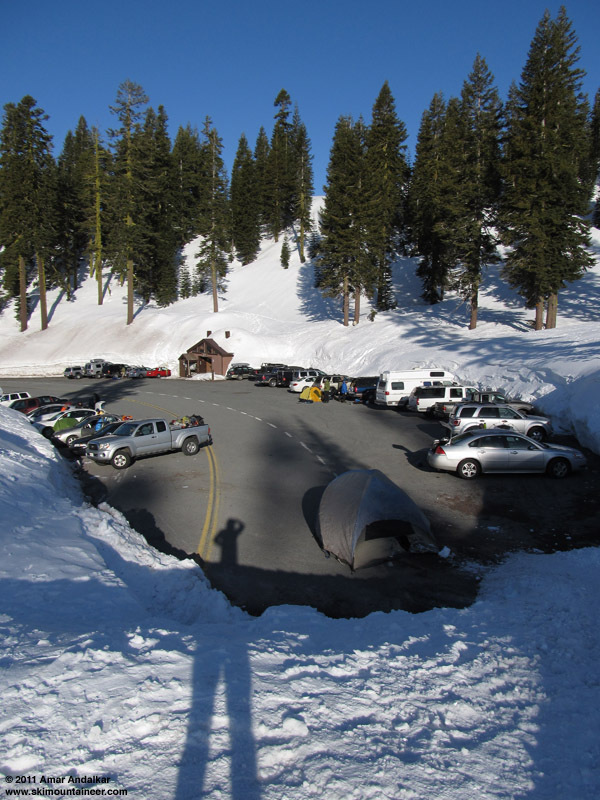 I drove the first 550 miles down to Mount Shasta by Friday evening, arriving at 6950 ft Bunny Flat around 11pm to find temps a chilly 25 �F and skies mostly clear, with snowbanks 10-12 feet high still surrounding the parking lot. An unseasonably cold upper-level low had moved southeastward through the Pacific Northwest on Thursday-Friday, bringing heavy mountain snow to Washington and Oregon with snow levels below 1000 ft. Even in northern California, the freezing level dropped to 3000 ft, although precip was minimal that far south and skies remained mostly sunny. I awoke in my car the next morning at dawn, to find the temperature had plunged to only 14 �F by 6am with totally clear skies. 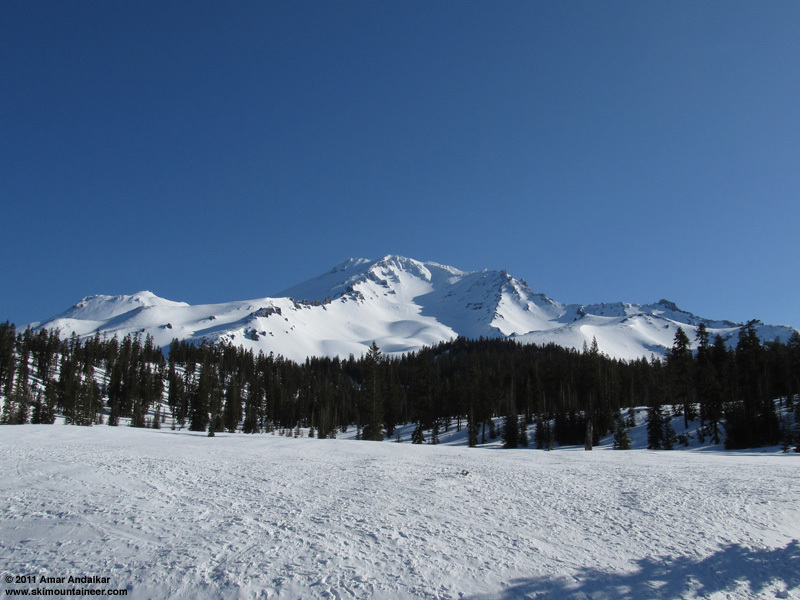 I wanted to ski something that morning on Shasta, but time was limited: I was still 250 miles from Loomis, and needed to arrive there well before the 4pm start of Dave's memorial, so I'd have to be back to the parking lot by 11am or so. Icy cold morning in the Bunny Flat parking lot. I lingered in the car as long as possible to avoid the frigid cold, waiting for the sun to rise high enough above the trees to start filling the parking lot with light and warmth. Eventually I got out just before 8am and got ready to ski -- but what would be worthwhile under such hard-frozen spring conditions? 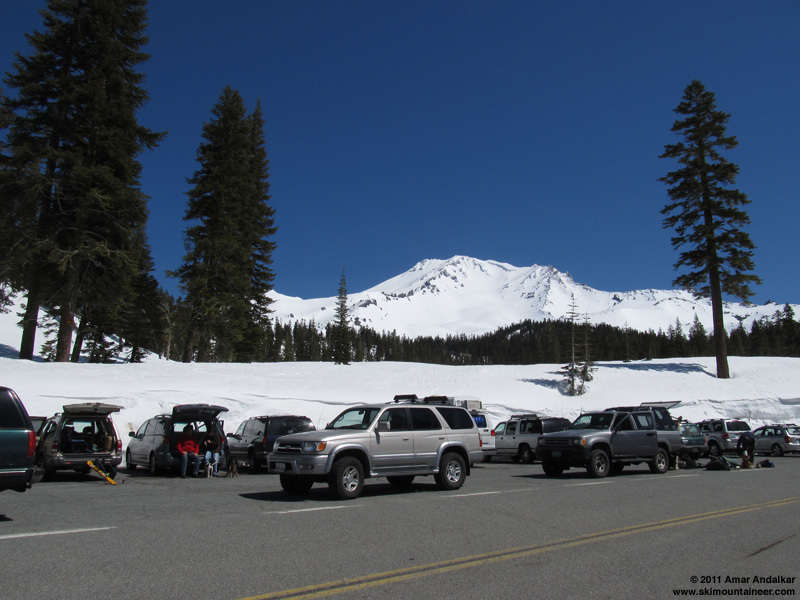 The snowpack in northern California is now at a very different stage of seasonal evolution than it is in Washington and Oregon, which have near-winter conditions lingering and snowpacks at or near seasonal maxima at many locations as of late April. 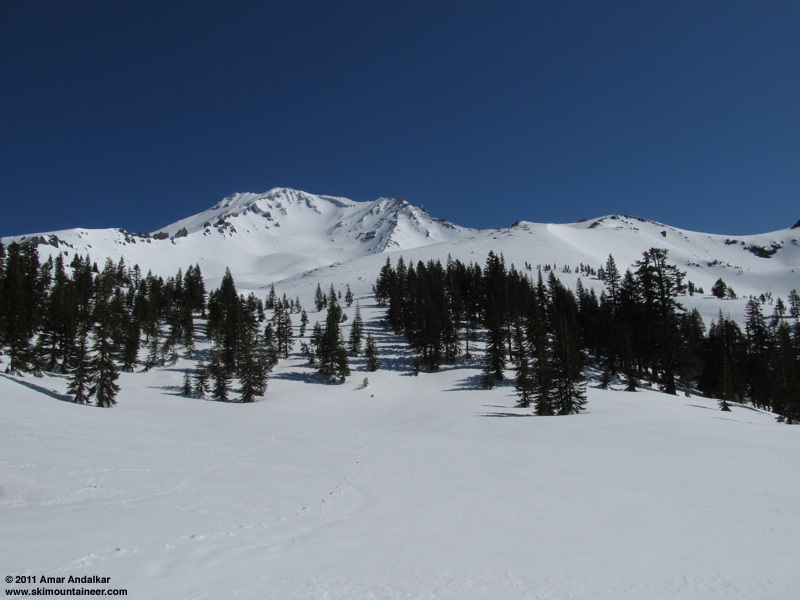 But heavy snowfall in California ended in late March after 10-20 ft of snow fell in two weeks, building snowdepths to well over 200" at many sites on Shasta, Lassen, and in the Sierra Nevada. Over the next month snowdepths settled by 60-80" at most of those sites, with only a few small storms during April dropping a few inches of snow each. So the northern California snowpack is now very much in a stable spring melt-freeze cycle, frozen rock-hard in the early morning and softening each day under the abundant sunshine. Looking up at Shasta from Bunny Flat, with Sun Bowl the second bowl at right just above the trees. I hemmed and hawed for a long time at the parking lot, unable to decide what to do. Whether to ski at all, and if so, what to ski. Eventually I decided on Sun Bowl, a south-facing bowl less than 2 miles from the parking lot, located along the ridge just south of Avalanche Gulch. It would have more chance of softening by 11am on this day than anything else nearby. A closer view of Avalanche Gulch (left) and Sun Bowl (near right) from partway up the ridge. I finally skinned up well after 9am, the snow still frozen solid in most spots, with only the sunniest southeast aspects softened slightly. 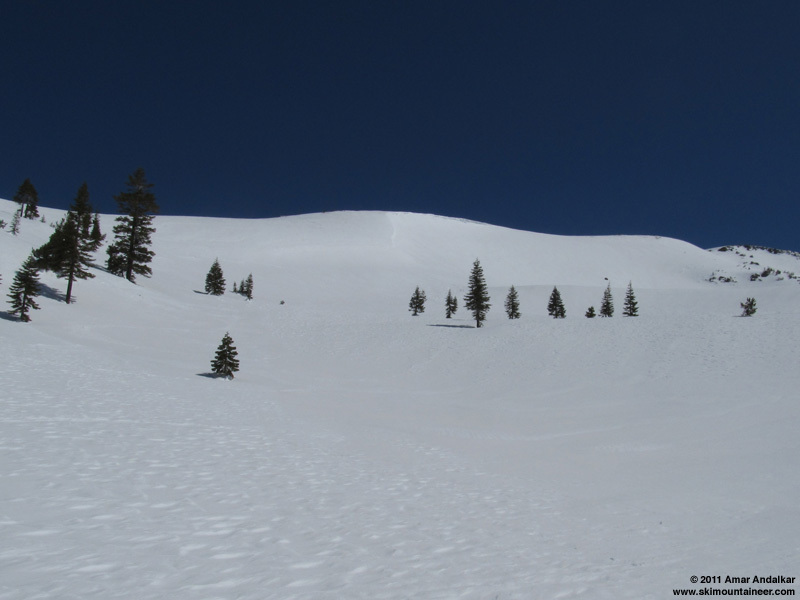 The route to the top of Sun Bowl follows near the crest of the gentle ridge, so it was easy to skin the frozen snow without needing ski crampons. Strong NW winds the previous day had scoured the snowpack atop the ridge, but hopefully they hadn't built any windslabs in the steep south and southeast aspects of the bowl below the ridge. 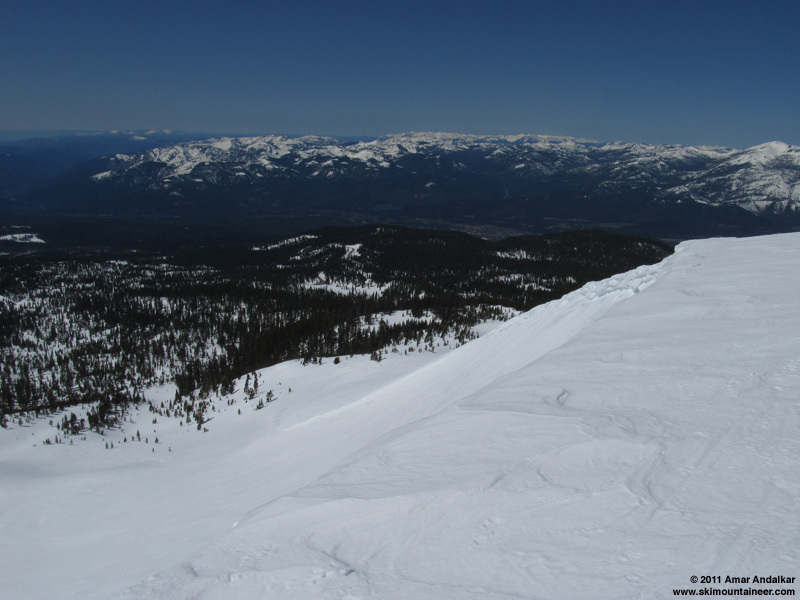 View looking west across the cornice atop Sun Bowl, with Mount Eddy in the Klamath Mountains in the distance at right. Topped out on the cornice atop Sun Bowl at 8850 ft by 10:45am, and did a quick standing changeover in a cold 10-15 mph SE breeze. The top of Sun Bowl below the cornice is a bit over 40 degrees steep, but it rapidly flattens out to more like 30 degrees sustained. Nevertheless, in the frozen conditions and with my much-too-dull edges, it was dicey skiing for the first few turns after I traversed in below the cornice. And then thankfully, I found a long pillow of wind-deposited packed powder extending down the length of the bowl along its western edge, only 3-4" deep -- it was perfect, too shallow to cause any avy hazard, but deep enough to ski nicely and avoid the hard-frozen snow of the rest of the bowl. It turned out that the shallow wind slab was nicely bonded to the underlying frozen corn anyway, and it skied great with no breaking-off or sluffing. View looking back up Sun Bowl, with my ski tracks barely visible. Then out the bottom of the bowl and back below treeline, with occasional sections of slightly softened corn on the sunniest southeast aspects of various rollovers, but still solidly frozen on anything shaded. Skied down the fall line back to the unplowed portion of Everitt Highway and followed it a half-mile west back to Bunny Flat just after 11am. Much more crowded by now, with the weekend climber crowd arriving in full force and quickly filling the parking lot. It felt so nice to get out in the sunshine and ski something, anything, on the morning of Dave's memorial. Wish it could have been a much bigger run, and really wish it could have been under very different circumstances. NOTE: No NWS Shasta forecast was produced on April 30. TODAY...WINDY. MOSTLY CLOUDY THIS MORNING THEN CLEARING. ISOLATED SNOW SHOWERS. HIGHS IN THE MID 30S TO MID 40S. NORTHWEST WINDS 20 TO 30 MPH WITH GUSTS TO AROUND 45 MPH. CHANCE OF SNOW 20 PERCENT. TONIGHT...WINDY. CLEAR IN THE EVENING THEN BECOMING PARTLY CLOUDY. LOWS IN THE LOWER TO MID 20S. NORTH WINDS 20 TO 30 MPH DECREASING TO 10 TO 15 MPH AFTER MIDNIGHT. SATURDAY...SUNNY IN THE MORNING THEN BECOMING PARTLY CLOUDY. HIGHS IN THE MID 40S TO LOWER 50S. NORTH WINDS 10 TO 15 MPH. SATURDAY NIGHT...CLEAR. LOWS IN THE MID 20S TO LOWER 30S. SUNDAY...SUNNY THEN BECOMING PARTLY CLOUDY. HIGHS IN THE MID 50S TO LOWER 60S. MONDAY...PARTLY CLOUDY. LOWS IN THE 30S. HIGHS 55 TO 65. TUESDAY...PARTLY CLOUDY. LOWS IN THE 30S. HIGHS 55 TO 65. WEDNESDAY...MOSTLY CLEAR. LOWS IN THE 30S. HIGHS IN THE 60S. THURSDAY...PARTLY CLOUDY. LOWS IN THE 30S. HIGHS IN THE 60S.